The government is further moderating the supply of land for the private residential property market. As announced by the Ministry of National Development (MND), there are only 4 confirmed sites in the latest Government Land Sales (GLS) Programme for the 2nd half of 2015, and a total of 8 other sites on the reserve list. 3 of the confirmed sites at Alexandra View, Clementi Avenue 1 and Siglap Road, are being set aside for private residential housing, with the remaining 1 for the executive condominium (EC) at Yio Chu Kang Road. In total, the 4 sites can yield up to about 2,130 private residential and EC units, which is about 33.3% lower than the 3,020 units being offered in 1H2015 and about 46% lesser compared to the 3,915 units offered a year ago in 2H2014. It was being forecast by experts in the earlier article where MND expects to maintain supply of private housing sites in H2 2015. The 8 sites on the reserve list, which means they can only be triggered for a public tender if a developer makes an acceptable opening offer, can yield an approximate of another 5,695 homes. Housing analysts said that the cutback in land supply did not come as a surprise. According to the key executive officer at ERA Realty, Mr Eugene Lim, there was a ramp up in land supply for the past couple of years. Adding up to the latest supply numbers, presently there will be about 84,000 homes in the pipeline. It was also mentioned that this is a huge pipeline of homes for the next few years. 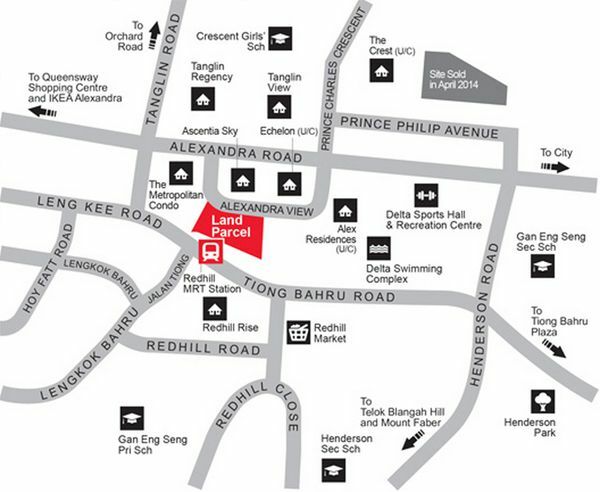 One of the land parcels for sale at Alexandra View (situated next to Redhill MRT Station) is set to line up along some of the area’s prominent condominiums such as Ascentia Sky, Echelon and Alex Residences. It was noted by CBRE’s head of research for South East Asia and Singapore, Mr Desmond Sim, the current growing number of unsold residential units for the past few quarters could be the reason that the government has been holding back these leasehold sites. So before we get to see more land to be sold to property developers, the backlog amount of unsold properties will be expected to decrease to a much healthier point. Also mentioned by Mr Sim, the property developers could still trigger a site for for sale from the reserve list if the market is in need for more land to be developed. As for land supply on the commercial front, no sites have been put up on the confirmed list this time round. But property watchers highlighted that the newly-added “white site” at Marina Bay is likely to generate strong interest from property developers due to a lack of new office spaces in the Central Business District (CBD) area. The MND mentioned that this site is being released in order to further expand the CBD at Marina Bay, which we are already a healthy mixture of commercial buildings such as the Marina Bay Financial Centre and Asia Square Tower 1 & 2, together with luxurious condominiums namely The Sail @ Marina Bay, Marina Bay Residences, Marina Bay Suites and the upcoming Marina One Residences. The closely watched mixed development site at Holland Road (expected to offer an estimate of 580 private homes and 13,500 square meter of commercial space) also remains on the reserve list, after being transferred from the confirmed list in 2H2014. Holland Village has been highlighted as one of the areas for rejuvenation under the latest URA Master Plan.